Baltimore sure has made national news a lot lately. First, for the death of Freddie Gray and the subsequent riots that rocked the city, and now, when former Baltimore City Mayor and Maryland Governor, Martin O’Malley announced his candidacy for president. 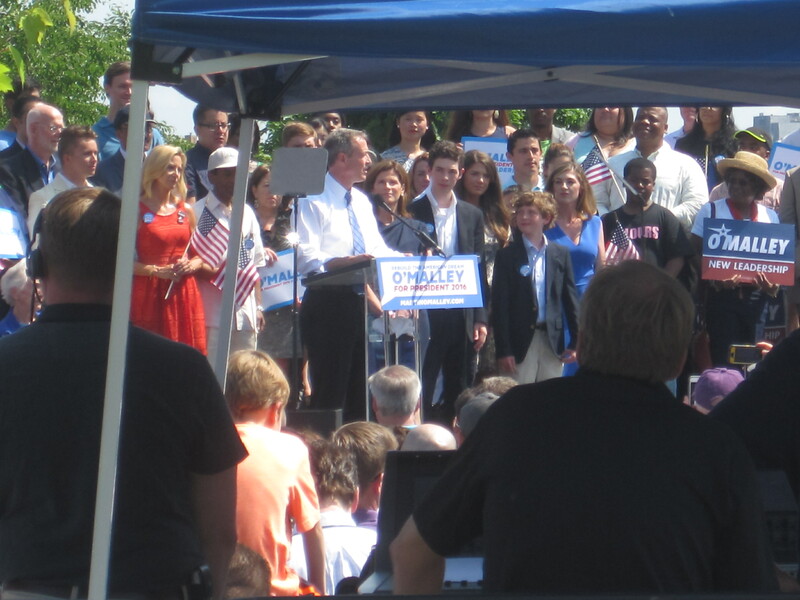 After seeing that Governor O’Malley would be making an “announcement” Saturday morning on Federal Hill, I persuaded Adam to come with me to check it out – how often does a politician announce he’s going to run for president right in your own backyard? Adam and I first walked to Dunkin’ for coffee and breakfast and then headed over to the event. 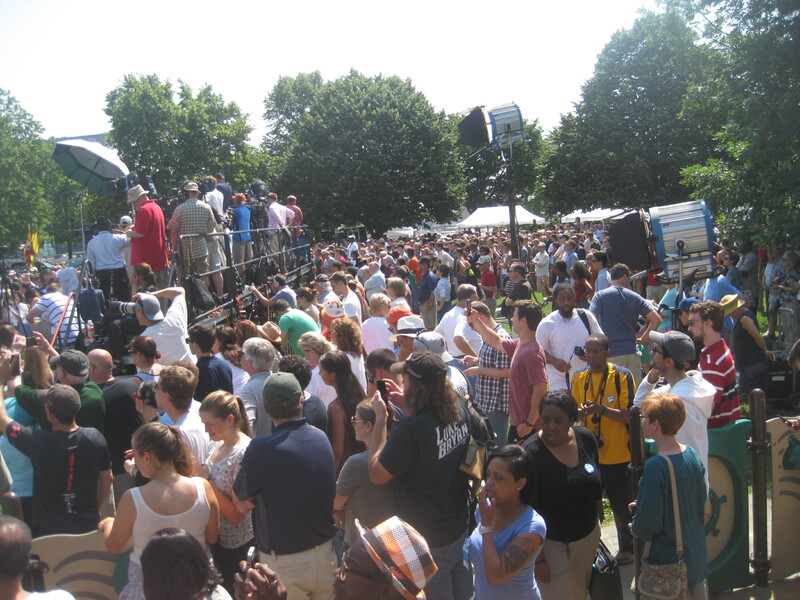 It was pretty crowded and pretty hot up on Fed Hill and we walked around checking out the scene before settling down in the shade and listening to the Kelly Bell Band – a well known local group – play some upbeat, bluesy tunes. Many people in the crowd seemed to know each other and were chatting amiably while kids ran around the playground, it felt more like a neighborhood block party than a political rally. 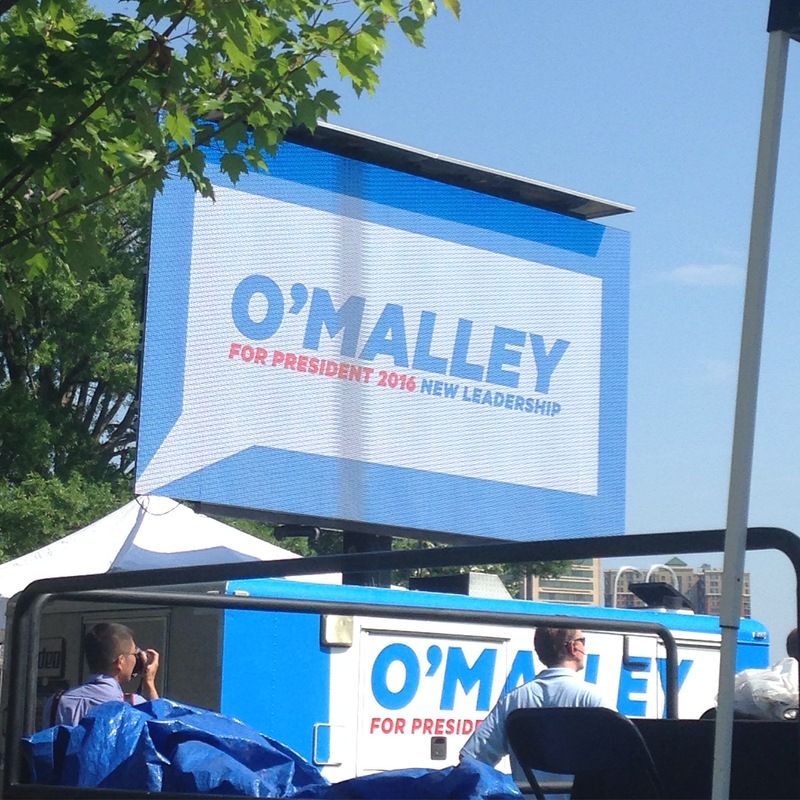 Eventually the program began – with a performance by a children’s choir and some testimonials about O’Malley from four Maryland residents. 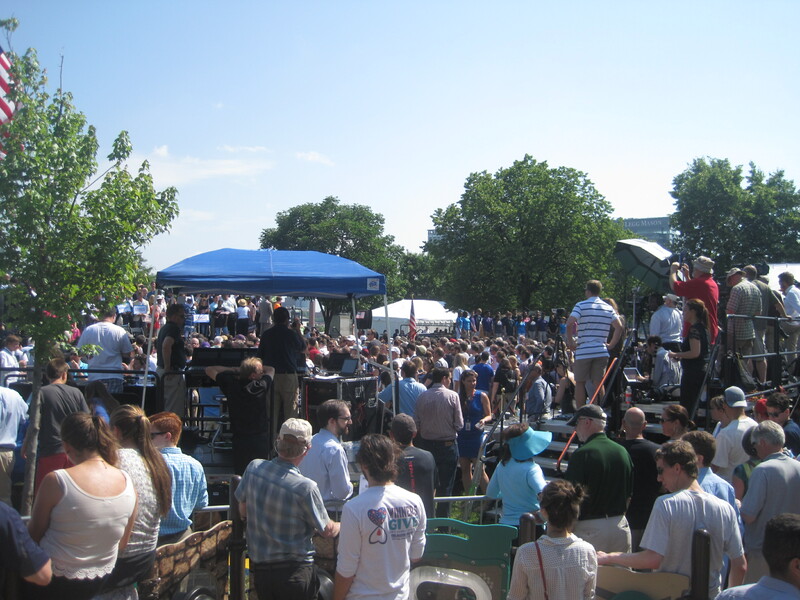 Adam and I had climbed up on a jungle gym for a better view of the stage and were definitely sweating in the midday sun by the time O’Malley came out to speak. 1. Marriage Equality – O’Malley came out as a very strong proponent of marriage equality and touted that Maryland passed legislation granting equal marriage rights to gay and lesbians during his tenure as governor. He also included transgender in his speech. 2. Education – both of the Maryland has the best public schools and of the affordable higher education kind. 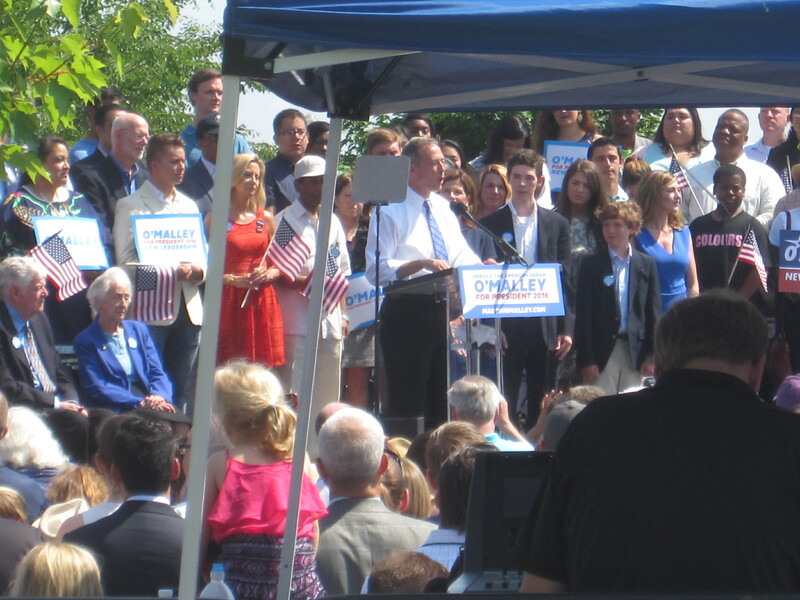 O’Malley also emphasized his pride in the Maryland Dream Act which was passed while he was Governor and grants in-state tuition to undocumented immigrants attending college. 3. On that note, immigration – like most democrats, O’Malley supports “comprehensive immigration reform.” He poetically added that the symbol of our country is the Statue of Liberty, not a barbed wire fence. 4. He’s not Hillary Clinton – O’Malley emphasized that we don’t live in a monarchy that is ruled by two families (Bush and Clinton), but that he would provide a new, fresh voice in the White House. 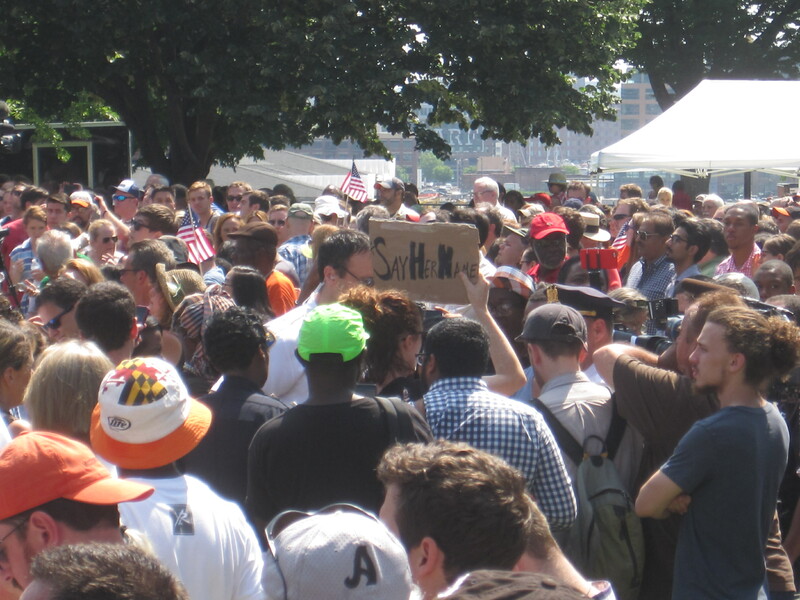 While O’Malley was speaking, there was a protester in the crowd with a hastily drawn “Stop Killer Cops” cardboard sign causing some commotion. 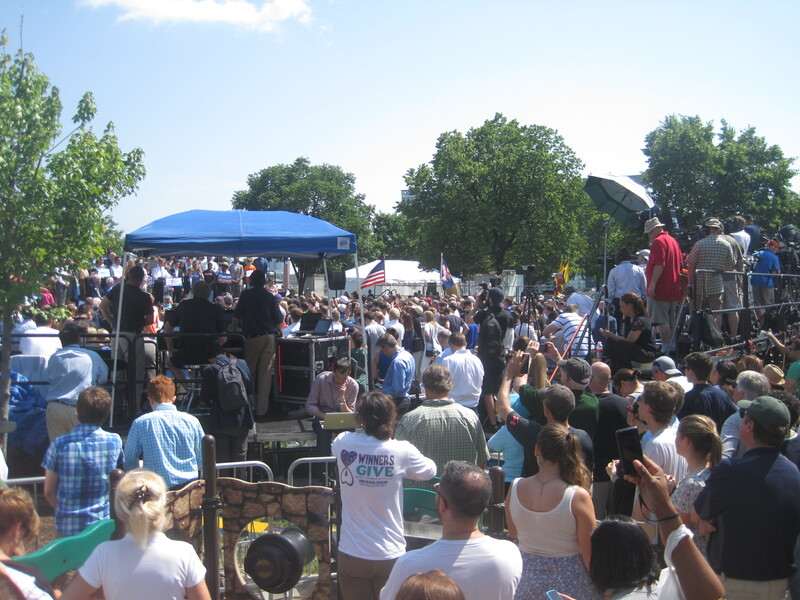 She was behind the bleachers set up for the press and completely out of O’Malley’s line of sight, but she did garner attention from the photogs and journalists covering the event. I was actually surprised there weren’t more protesters around the event, especially given the unrest in the city over the past few weeks. 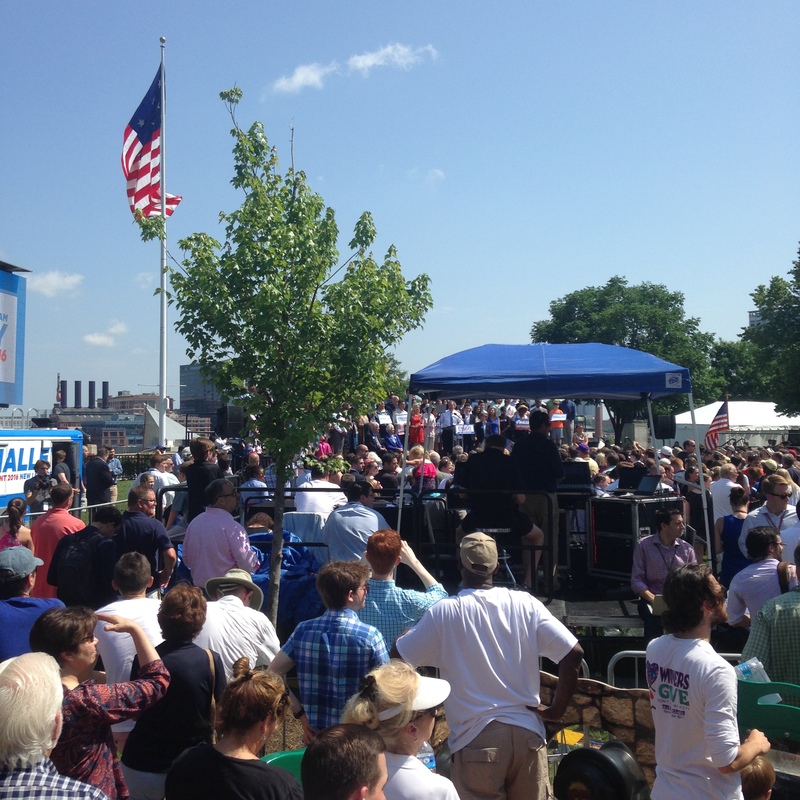 As an undergrad government major who grew up in DC, I am definitely a sucker for patriotism and politics and I’d be lying if I didn’t feel a certain bit of pride as O’Malley laid out his hopes and dreams for our nation underneath Federal Hill’s giant American flag. Dare I say Clinton/O’Malley 2016?